Kenny Jackett wants Pompey to put themselves in with a chance of a potential glamour FA Cup third-round tie. The Blues are on the back of five successive victories as they prepare to take on League One rivals Rochdale in English football's oldest cup competition at Spotland on Sunday. 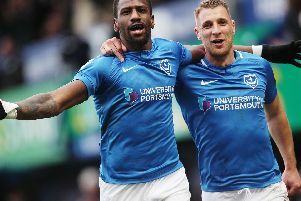 A win would secure Pompey's spot in round three for the first time since 2015. And a tie against Premier League opposition could await them. However, Jackett knows the task his side face to progress past Keith Hill's Rochdale. Dale reached the fifth round last season, taking Spurs to a replay before bowing out. And Jackett insists there is still plenty of work to be done before any potential money-spinning tie. He said: 'It’s a competition that we want to progress in and you have to come through many different tests. ‘The first round was a very tricky away tie at a non-league club, which we came through very well. ‘This one is a team at our own level. ‘There are different types of tests and this is one of them.